In my last column concerning my trip to the middle east, I left off with our visit to the Yad Vashem – Holocaust Museum. 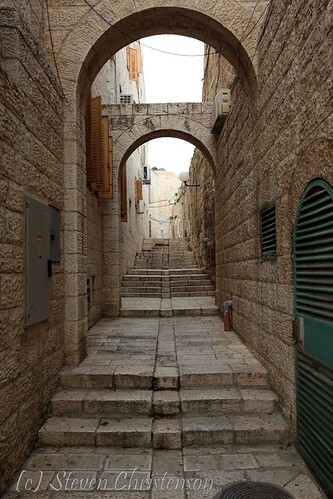 In truth we went many other interesting places before then: the Book Museum (about the Dead Sea Scrolls), St Stephen’s Gate, the Church of the Holy Sepulchre, the Mount of Olives, and many other places within and nearby the walled Old Jerusalem. 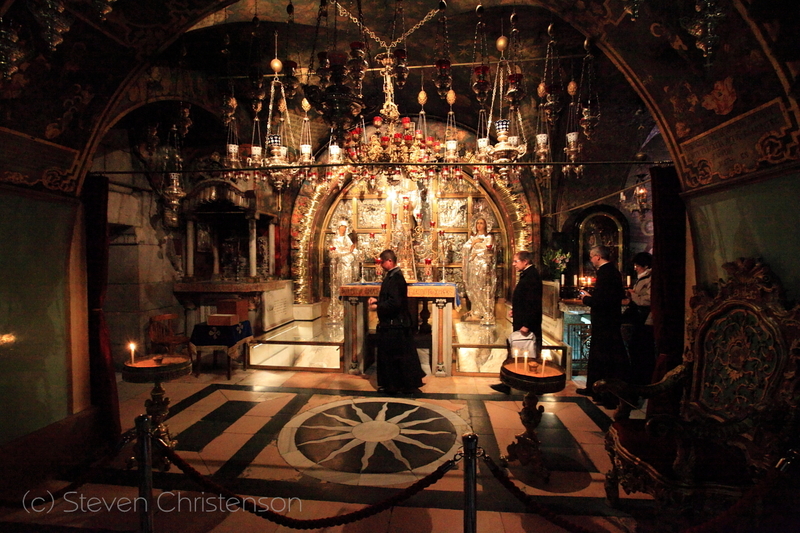 The Church of the Holy Sepulchre while it is unlikely that it was the actual place where Jesus was entombed after his crucifixion and where he was raised to life again was compelling nonetheless. There was a palpable somber, pious attitude and a great throng of respectful people. It certainly made me think about the roots of the Christian faith – the death burial and resurrection in a way that I’ve never really thought before. It was suddenly far less theoretical – I may be standing where it all took place. 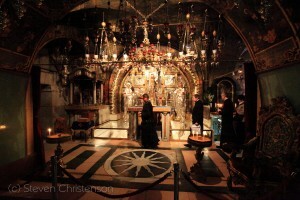 The interior and exterior of the church (actually about 7 churches) told stories about the people within and without, and about the troubled birth pains of Israel as a nation. 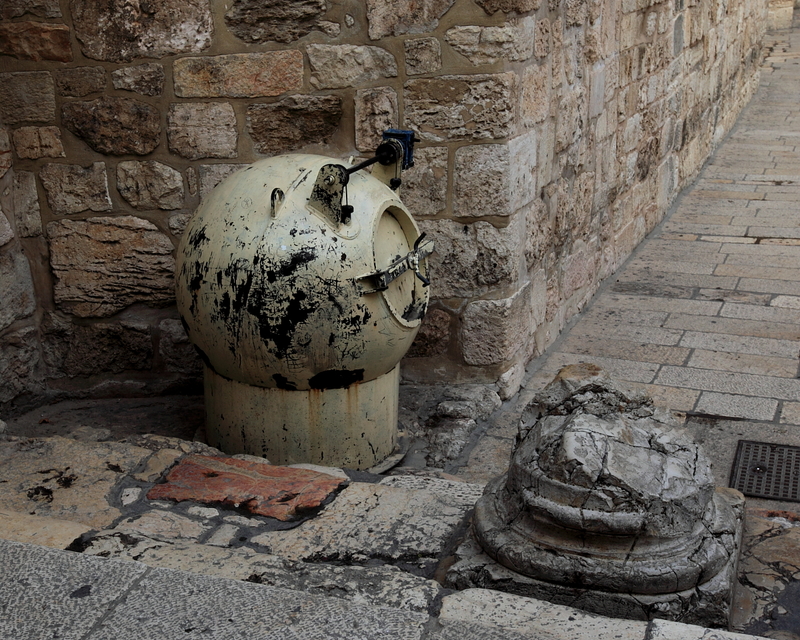 Outside the church is a bomb disposal chamber built of heavy steel. Fortunately it has been little (if ever) used, but is telling of the sad state of the human condition. 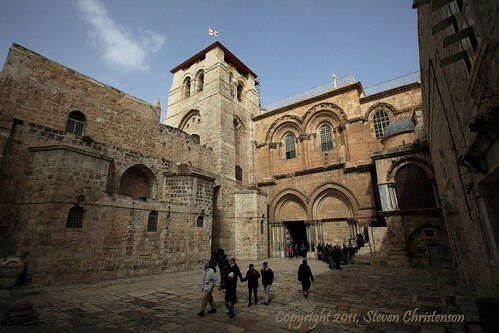 Photo 2: Exterior of the Church of the Holy Sepulchre. Note the bomb disposal chamber at the extreme lower left. 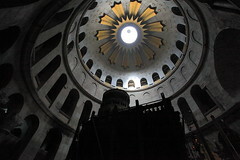 Photo 4: The Sepulchre is within an Aedicule (the dark structure at the bottom) which is under a church dome. We also visited around the Western Wall of the Temple Mount, known also as the Dome of the Rock to Islam. A small cadre of Israeli soldiers were touring as well. There was one spot on our tour that was particularly difficult for my wife. 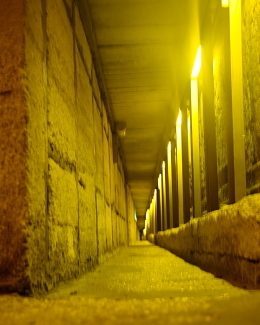 She is claustrophobic and the tunnel along the wall of the Temple Mount was, let’s just say, difficult for her. At it’s narrowest (which was most of it) two normal sized people would have to struggle to pass one another. Fortunately there were wider alcoves at various points that were better lit and slightly less “interactive”. Eventually, of course, the trip must end. Ours ended well considering my getting separated from the rest of the group on the night we were to go to the airport. We made a stop at Old Jaffa as it was growing dark. Dark! Again I didn’t bring my tripod, I left it on the bus, so all of my exposures required using props to support my camera. We visited several ruins, but before we even set out, our guide said: If we get separated, we will meet on the far side of the church. Good that I remembered that – but wish I had done it. As we meandered around in the deepening dark, several things, of course caught my eye including a sculpture that our guide helped us to interpret. A few of us night photographers (i.e. 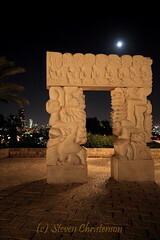 Rick and I) were busy ignoring David trying to get the moon and the modern city of Jaffa in the shot. Right after I shot the sculpture, I noticed people were still around, so I shot the next scene on a whim. It was dark and I was surprised by what I saw, so I reshot it, reframed it, reshot it, adjusted my exposure. Improve the stability of my makeshift tripod (a wall with my phone and lens cap serving as additional support). Every shot was about 30 seconds. Eventually I looked up and noticed everyone was gone. Trailing off in the distance I could see a group walking together. I ran after them – literally. They weren’t going “behind the church”, but some of the pathways were closed and perhaps the guide knew the best way. Or perhaps they were visiting one last thing before heading to the bus. The group turned a corner in the distance. I ran faster. Eventually I got to the corner and it was looking much more residential. I surveyed the main street. No bus. The group I was chasing stepped into some streetlights and… well it wasn’t MY group. Who knows how long I had been photographing alone in the dark – it’s easy to lose track of time. I looked at my watch and it said about 7:05 – and our restaurant reservations were for 7:30 (I thought – later learned that they were for 6:30!). I wasn’t worried, but I decided to call my wife who of course informed me that they were all “on the bus”. “Where?” near the canons at the front of the church. Well, that was a tough one because I was a long way away. I found my way back to where we started the entire walk quickly – and the church was in the distance. My wife let me know that 3 people were out looking for me. Of course they didn’t have cell phones. When I got near the church I spotted one of my searchers just as I also spotted the bus. Yeah! But now problem number two arose: some of the searchers are still out searching. And unfortunately, they weren’t ONLY searching for me. 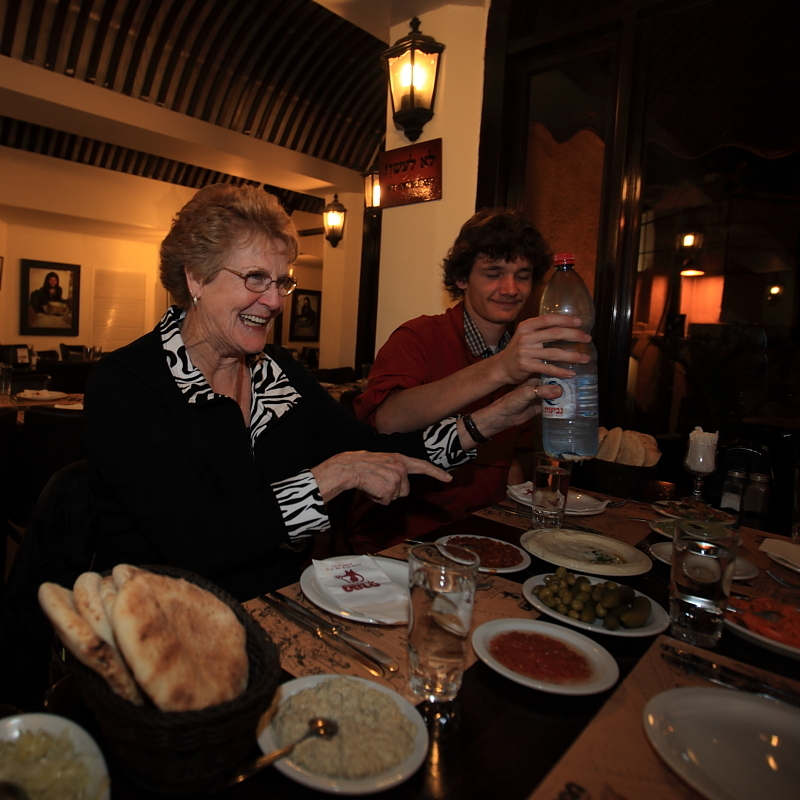 We found our additional lost soul eventually – right around 7:20 PM and headed straight for the Magana restaurant in the old Yemeni section of Jaffa. The bus couldn’t get in those narrow streets so we walked a few blocks. Let me get right to the point now: the food there was the BEST of the entire trip. Wonderful! Scrumptious! Photo 9: Magana for Dinner. YUMMY! It didn’t hurt that we were the only group in the restaurant which had stayed open late just for us. We had fantastic service, great tasty food. And afterward, we all headed to the airport. Most left that night, my wife and I, and another couple went to a budget hotel to spend a few hours (from midnight to 4 am) after which we had to leave to catch our flight home. Security was pretty thorough in Ben Gurion Airport, Tel Aviv. My large backpack and tripod often attract attention of the screeners. But the last few bits of the trip had us flying to London, and thereafter home to San Francisco with a plane full of London kids who were anxious to go skiing in Tahoe. They all complained when the plane touched down in San Francisco. The weather was dreary the day we arrived and the Londoners had left far better weather behind. I don’t know if they got what they wanted, but traffic to Tahoe was snarled for for the next few days as the last bits of a fierce winter storm dropped 8 feet of snow in the Sierra. Oh, and I almost forgot. On the night flight out I got to see (and photograph) the Auroroa Borealis. Sweet. Next I have to try it from the ground! 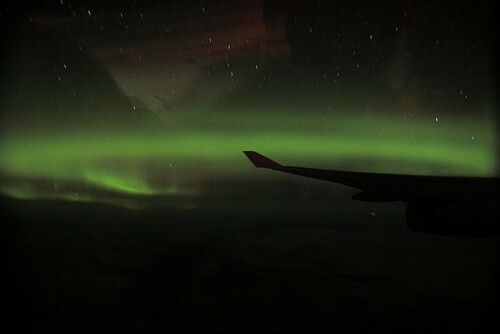 Photo 10: Aurora Borealis through the window of the 747. 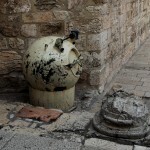 This entry was posted in Ravings, Travel and tagged Israel, Jordan, travel on February 21, 2011 by Steven Christenson. 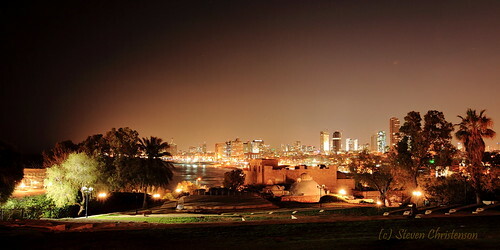 Great shot of Old Jaffa and New Tel Aviv. There is something about that sculpture and the hilltop setting that invites people to linger and take photos. 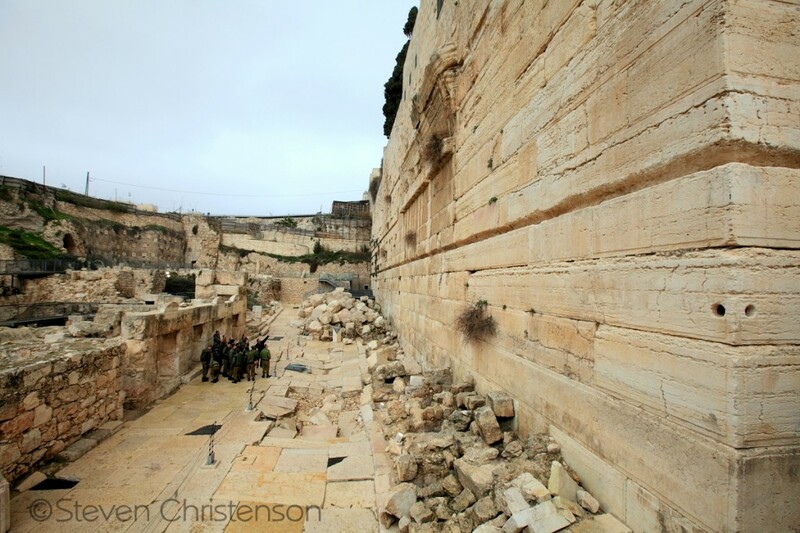 I recently returned from leading a tour through Israel. Jaffa was our final stop before flying out at midnight. After not losing anyone on the rest of the trip, I lost four at that sculpture, for the same reason as you: they got totally absorbed in taking photos. Fortunately they remembered the name of the restaurant and made their way there while I was out searching for them.